Before you decide to shoot that drone out of your backyard, there are a few important things you need to know. First of all, damaging any flying robot is a federal crime. It doesn’t matter if it’s crashing your pool party or watching you in your skivvies through the skylight in your master bath. Here’s the thing. You might view a drone as many things: Creepy. Loud. Annoying. Scary. A sophisticated robot. A really cool toy. Target practice. ...shall be fined under this title or imprisoned not more than twenty years or both. What does that mean for you? If you attempt to gun down a flying robot, you could face those two decades in the slammer, and/or a fine of up to a quarter of a million dollars. So, legally speaking, shooting a drone could be the same as trying to damage a chopper or a 747. “Aircraft” is a pretty sweeping definition, it turns out, and it could work in drones’ favor. Since when did a flying, remote-controlled robot become a legally binding “aircraft”? Not that long ago—only last November, as a matter of fact. In 2011, a photographer named Raphael Pirker shot a commercial at the University of Virginia with one of his drones. The FAA decided to fine him because he’d flown his hobbyist drone way too low, close to buildings, cars, and pedestrians. A legal battle ensued, and ultimately the National Transportation Safety Board ruled in November that drones are considered aircrafts, and are subject to FAA regulations. 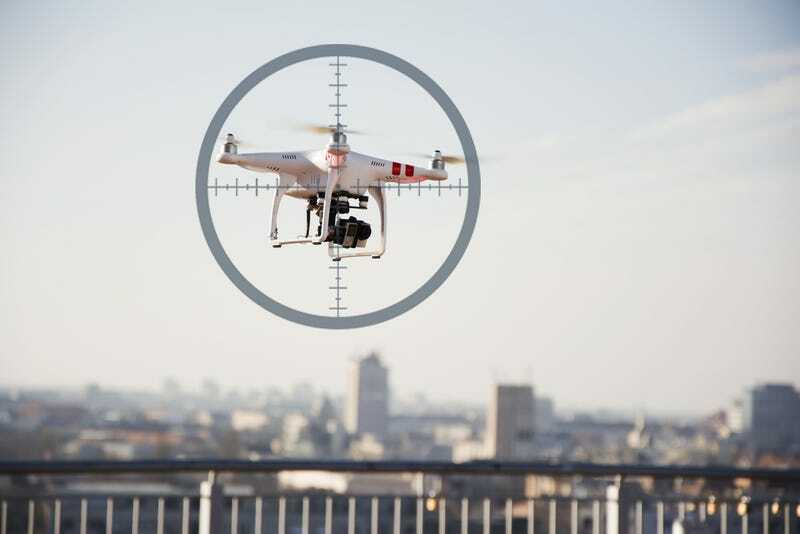 Recently, people have continued to take literal aim at drones. Last September, a New Jersey man was arrested after shooting down a neighbor’s drone. Just last month, a viral video showed a firefighter spraying a drone with a firehose. Another man had to pay $850 after shooting down his neighbor’s UAV. FAA spokesperson Laura Brown told Gizmodo: “We do consider unmanned aircraft to be ‘aircraft,’ but the damage issue is more a destruction of personal property question that is outside our jurisdiction.” The Department of Justice didn’t respond for a comment for this story. Unfortunately, you can’t bring drones down just because you think they’re a nuisance, even if they’re invading your privacy. There is, however, one plausible reason that could result in your whipping out a shotgun and felling the flying vehicle: Self-defense. It sounds like a cyberpunk, apocalyptic scenario, but if you ever found yourself in a situation where a drone is not only trespassing on your property, but is intentionally trying to harm you, then you can probably shoot it down. But this is only if the drone is swooping and trying to ram itself into you, or was outfitted with some (illegal) ammo of its own and started opening fire. Violent retaliation in the name of “self-defense” has proven to be a slippery slope in America, and drones could be no exception. After all, if one person finds a drone hovering outside his or her bedroom window, spying, couldn’t that kind of buzzing voyeurism be considered a “threat”? Not quite, Sachs says. “It would have to fall under ‘self-defense’ as it is commonly known: to save yourself from deadly force, or imminent bodily harm,” he says. Someone simply looking at you doesn’t cut it. Put another way: If someone starts taking pictures of you on the street, that doesn’t give you the right to punch ‘em in the face. But isn’t trespassing on your property enough for you to open fire? Nope. However, trespassing is grounds for you to call the police—even if you can’t break out the boomstick and go all Scarface. Just because you find a drone on your property, it doesn’t mean you have the right to attack it. There are reasonable limits, though. Just because the law protects drones from your physical wrath, it doesn’t mean UAVs have full aerial reign. Many states have “peeping tom laws” that prohibit voyeurism. It’s still prohibited, even if it’s voyeurism-by-drone. That said, there’s a huge difference between a drone violently diving in through an open kitchen window, and one that’s circling around the cul-de-sac down the street. If there’s a drone in your neighborhood that’s capturing video or taking pictures of public places, the operator is within his or her First Amendment rights, Sachs says. Another reason to avoid shooting machines out of the sky? Common sense. You may have heard news about governments building big-budget, Hollywood-style mega weapons to take down killer drones. This situation is clearly apples and oranges, since military law is vastly different from civilian law. For example, the US Navy constructed an anti-drone laser recently, and Japan and China have also looked into drone-zapping artillery. In combat zones, drones actually are intended to harm humans, so in that situation, killer lasers are A-OK. Finally: Just because you see a drone in the sky, doesn’t mean it’s a malevolent spybot from Terminator’s Cyberdyne. It’s probably perfectly harmless. But even if you declare the drone a threat to you and let the bullets fly, you need to be prepared to face a fallout of lawsuits, potentially staggering fines, and prison time. As long as the drone isn’t trying to physically hurt you, there’s not much you can do, besides call the cops. Otherwise, the laws are still evolving. Unmanned aerial vehicles are a new technology, and the more they’re woven into our lives, the clearer the rules will become. In the meantime, put yourself in the shoes of the person flying the drone, likely a hobbyist just taking the thing for a spin. In most cases, you shouldn’t freak out. Your neighbor’s drone is probably more scared of you than you are of it. Correction, 7/22/15: An earlier version of this story stated Japan was developing anti-drone lasers. Japan is simply interested in using such tech, which was developed in Germany. This article originally appeared back in July.